Forty-four years ago, the Roe v. Wade and Doe v. Bolton decisions eliminated the legal protection from abortion for women, and the responsibility of children disproportionately shifted to women. 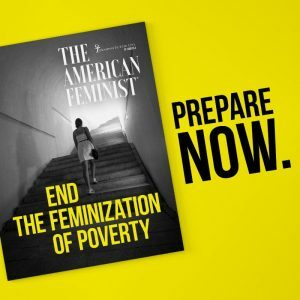 In the latest insightful issue of The American Feminist, we take the next step to systematically look at poverty and model resources, as well as solutions, and come closer to achieving the unrealized vision of our first wave feminists, who sought to address the root causes of abortion. If you have not renewed your support with Feminists for Life, please do so now, and if you are not yet a member, we invite you to join us. Help us address a poverty of spirit, reclaim feminism, and raise expectations in schools and in the workplace, along with paternal support. Thank you.